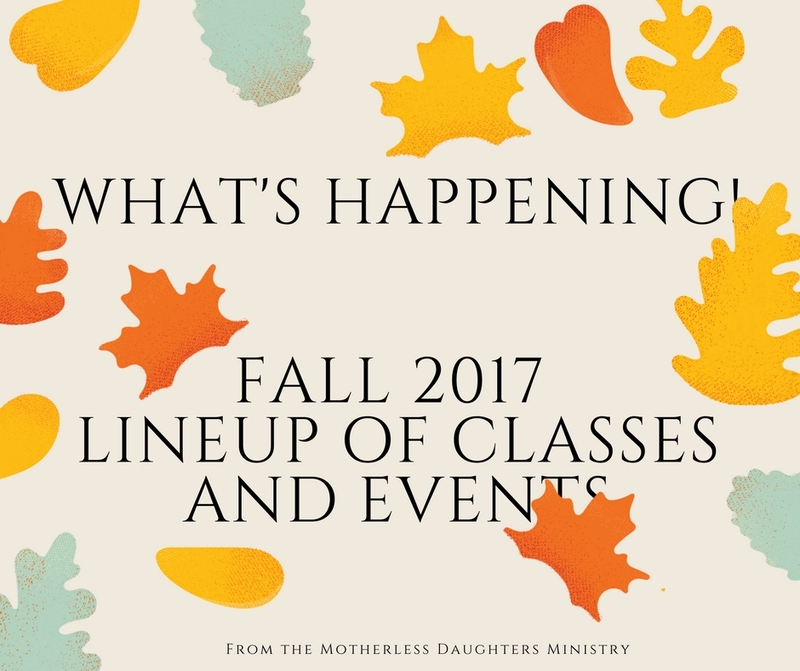 We have been diligently working over the summer to create a fantastic fall lineup of classes and events from the Motherless Daughters Ministry. Here is what is coming up! The Road to Forgiveness class begins Sept. 5, 2017. Click here for more details. Have you ever felt that losing your mother was much more than a physical death or loss of nurturing? The emotional loss is almost as overpowering. Have you wondered if there are other women who feel the same way and long to connect to each other? You are not alone. Maybe you’ve never even talked about your mother loss experience because it’s just too painful or uncomfortable. Maybe you need to read on…maybe this is for you, your time to be affirmed, to feel loved, to reflect, to quiet yourself…so you can begin healing. The Journey: Healing the Wounds of Mother Loss One Step at a Time focuses on mother loss & its effect on your life, how her absence shapes your identity, influences your style of mothering and relationships, how your grief surfaces throughout your lifetime, and how you experience living beyond your mother’s final years. This 12-week class could literally change your life. Are you ready? The Journey Class begins on Sept. 6, 2017. Click here for more details. In this 6-week class, we will be using the book Will I Ever Be Good Enough: Healing the Daughters of Narcissistic Mothers by Dr. Karyl McBride Ph.D. We will work to instill an understanding and realization of your mother’s condition and the effects that her narcissism has had on your life. Narcissism is often rooted in family history. It is a life long struggle to break the bonds. This understanding empowers self-trust and self-acceptance of who you are today and that YOU are good enough. Will I ever be good enough is not really a question but it is a judgment. It is a message that you may have received from your mother. It implies that we are not good enough and so what may happen is that we judge ourselves and assume others are judging us critically. Daughters of the Narcissistic Mother will begin on Oct. 12, 2017. Click here for more details. Motherless Daughters Ministry’s “Connections & Conversations” group can help you process your feelings and choices. We meet monthly, in an informal, yet supportive setting to discuss how mother loss, whether through death, neglect or absence, has affected us as women. Motherless Daughters is a non-profit organization that hopes to serve you; join us to connect, laugh, talk and know you are not alone. This invitation only picnic will take place on Sunday, September 24, 2017. It is for 2017 volunteers, donors, hosts, and new motherless daughters. Specific location details will be sent via invitation. 2018 is shaping up to bring you even more – High Performance Communications, You Were Made for More, the Emotionally Absent Mother, the Journey Retreat, Bible Art Journaling, Facilitator Training, and monthly Connections and Conversations group. Stay tuned! It will be an exciting time! Whew! We are busy. Hope to meet you at one of these classes or events.